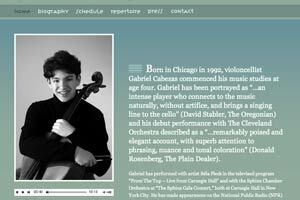 Born in Chicago in 1992, violoncellist Gabriel Cabezas commenced his music studies at age four. Gabriel has been portrayed as ��an intense player who connects to the music naturally, without artifice, and brings a singing line to the cello� (David Stabler, The Oregonian) and his debut performance with The Cleveland Orchestra described as a ��remarkably poised and elegant account, with superb attention to phrasing, nuance and tonal coloration� (Donald Rosenberg, The Plain Dealer). Gabriel has performed with artist B�la Fleck in the televised program �From The Top � Live from Carnegie Hall� and with the Sphinx Chamber Orchestra at �The Sphinx Gala Concert,� both at Carnegie Hall in New York City. He has made appearances on the National Public Radio (NPR) programs �From The Top� and �Performance Today,� and Chicago�s WFMT 98.7�s �Introductions,� as well as performances in Chicago�s Music in the Loft, �Exploring Music Live with Bill McLaughlin� and The Northeastern Illinois University�s Music Series.